An ouline of a pimp wearing a red had with red feather in it. 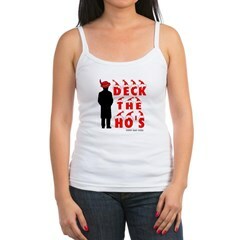 This pimp stands next to the words "Deck the Ho's" in red found with Santa Claus hats on each letter. Spend Christmas with your favorite ho.